Chano grew up in tijuana mexico and move to sd when he was 15. He grew up playing music and learned several different instruments. Chano played for and traveled with the orchestra in high school, performing at several different venues. After high school, he tried to continue on to music school, but found he hated it. No longer passionate about music, Chano found Muay Thai and boxing. He fell in love with the sports, and has been training for almost 6 years. 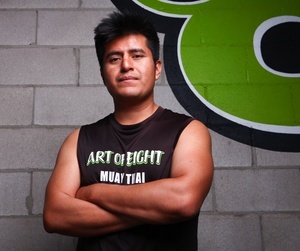 Chano has competed in a few amateur fights, but is most passionate about teaching and helping others train.